From the New York Times bestselling author of A Man Called Ove, My Grandmother Asked Me To Tell You She’s Sorry, and Britt-Marie Was Here, comes a poignant, charming novel about a forgotten town fractured by scandal, and the amateur hockey team that might just change everything. At first I thought I wouldn’t enjoy this book very much because it was about a hockey team, but I decided to read it anyway because of how much I loved A Man Called Ove. I was surprised that I ended up enjoying it so much. The story grew on me and I fell in love with the town, the hockey team, and mostly the characters. The book starts out with such a bang that I didn’t want to stop listening. I wanted to find out what happened, and to whom. It was fully explained toward the end of the book, and what I thought had happened really had a completely different ending. Then there was another part that left me with a question that was never answered. So, I’m hoping there is another book that will explain it. I usually don’t like books that leave something unknown, but this time I’m ok. I’m left wanting more, but ok. 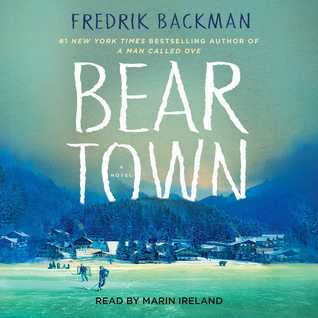 I do hope there is a Beartown 2 that will tell me what I’m wanting to know. I’m not a fan of cussing but since this was a book with a bunch of teenagers, mostly boys, I expected some. I did think some of the language was a bit harsh, but that’s just me. I thought the author did a great job with the characters. The teens were just like the kids who might live in your hometown, same with the parents. I thought Marin Ireland did a fantastic job with narration. There was a lot of emotions spilling out of this story, and I felt them all. It’s a book that will stay with me for a long time. I like sports related books, although baseball would be my preferred sport. I would give this one a try. You did a great review. Thanks Yvonne! I used to love going to Cincinnati Reds games when I was a kid. That’s really the only sport I’ve ever liked watching other than bowling. I don’t even know if they still have bowling tournaments on tv. I’ll have to check that out. This audio book sounds very listenable, Vicki. I enjoyed the movie, A Man Called Ove, recently. Terrific review! Have a relaxing weekend. I loved the book and the movie A Man Called Ove. Have you thought about reading the book? It’s so much better than the movie. I hope you have a great weekend too! Vicki, I have thought about reading A Man Called Ove, but because I have so many books to be read (way too many! ), I decided to watch the movie instead. Ove was a slow start for me too but after reading your review if that book, I stayed with it. That has become a favorite book so I will certainly try this one. It’s one of my favorites too Tina, I loved it so much! I’ve heard great things about this one but no one’s ever mentioned having unanswered questions. You’ve made me very curious. I hope you decide to read it Kathy, it was so much better than I expected, I should have known it would be since it was a Backman book.